It's not "just a shed", when it's a Fox Country Shed! 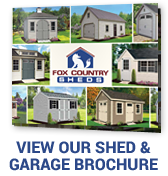 Whether you want to add an attractive and durable storage shed to your backyard, create a quiet outdoor room to entertain and relax or build the ultimate playground for your children, Fox Country Sheds builds a wide selection of handcrafted quality sheds, garages, gazebos and swing sets to meet all of your needs! Our outdoor structures offer attractive styling, solid construction and maintenance-free designs that are easy to love. Plus, every structure we build in our Lancaster County, PA facility can be customized to your unique needs and your budget. Lancaster County is known for it's quality Amish craftsmanship, handed down through the generations. Our sheds are delivered assembled via a shed trailer and placed right on your prepared site. For property with limited access, ask about our mule delivery or shed kits. We custom build sheds and garages for delivery across Pennsylvania, New Jersey, New York, Connecticut, Maryland, Delaware - as well as surrounding areas and nationwide. 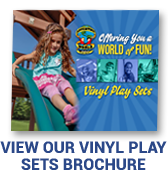 Call us today, or customize your shed, garage, gazebo or playset online! Either way, we're here to help you build the backyard of your dreams!